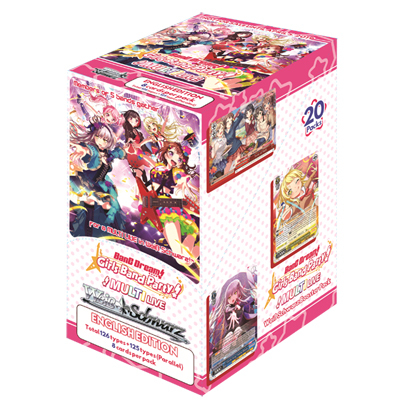 This is a pre-paid limited pre-order for 4 booster boxes of Bang Dream! Girls Band Party! Multi Live (English Edition). All 4 boxes will come from the same carton. By pre-paying during this period we guarantee your order to be stocked. The cards will be shipped to reach you on or shortly after release depending on when we receive them / how far away you are from our location / the type of shipping you choose. 8 cards per individual booster, 20 boosters per box. 126 Card Set + 125 Parallel Foils. English text. Pre-order period for this item ends at 10 PM on Sunday , January 13th. Release date is April 5 2019. Pre-Orders cannot be cancelled. Card set release date, details and images are subject to change before release as are number of cards/foils/signatures/etc in the set.